When SUPERMAN #6 ended on the most jaw-dropping cliffhanger, I couldn't wait to get my hands on the next issue. Superboy was back, and he was…a teenager?! What happened to Jonathan Kent in the weeks since he and Lois left Clark on Earth alone? When January’s SUPERMAN #7 dedicated an entire issue to Superboy's lost years, I was giddy with joy. And folks, Brian Michael Bendis, Ivan Reis and Brandon Peterson did not disappoint. The first page alone reveals the delicate care and emotion that Bendis was taking with this family story. 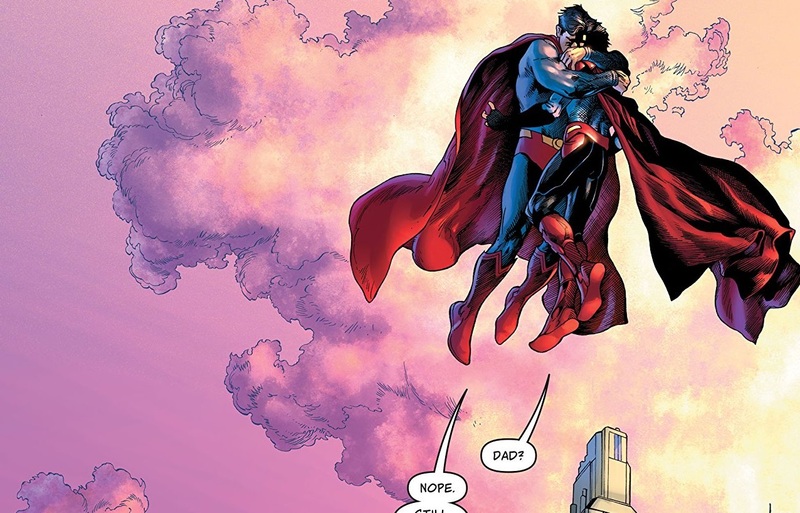 Superman hugging Superboy high above the city, letting his love take over in a vulnerable moment was so sweet and real. We've seen just how much Jonathan's absence has taken a toll on Clark. I know I'll never get the image of him alone at home remembering happier times with his family out of my head. While Clark is Superman, the Man of Steel and Earth's protector, he's also a father and husband. He's human when it comes to his love for his family. So, when Jonathan finally returned, regardless of how much he's grown up and changed, Clark's first instinct to hug his son like there's no tomorrow is beautiful. It reminded me of every time something bad happened to me when I was a kid and the first thing my mom and dad would do upon seeing me would be to hug me as tight as they can, as if the closer they brought me to them, the better things would be. That unconditional love is the strongest feeling in the world, and even super-powered Kryptonian heroes can feel that way as well. That's a lot of emotion for just one page, and Superman #7 just continues to bring the heart and happy tears from there. We finally begin (emphasis on "begin," as there is still so much time left unaccounted for as of the end of this issue) to learn what happened to Jonathan after he left with Jor-El and why he appears to be years older than when he left. He didn't run into any kind of colored kryptonite (which hilariously is what both Clark and Lois—probably along with thousands of comic book fans who know Superman mythology like the back of their hands—assumed). He simply grew up. While it's only been three weeks for Clark, Jonathan's adventures out in space were years for him. He grew into a 17-year-old, all without his father and mother sharing in all the experiences that come with growing into a teenager, let alone a teenage hero. I know I said there were happy tears, but this realization had to be as tragic as it gets. And when Jonathan sees his mom for the first time since she came back to Earth without him, the first thing he says is, "I'm so sorry, Mom." He gets it. He knows how much his parents have missed out on in his life. And it's unfairly balanced, since he's only missed three weeks of their life. This is a wound that might never heal, giving this once-perfect family a flaw—a scar that will always be there. Lois' anger with Jor-El is rightly placed, even if she was the one who chose to leave Jonathan and return to Earth. Even if/when the Kents are able to move forward past this bump in the road, they'll always have a hurt that can't be fixed and time they can't get back, all thanks to Jor-El and his manipulative plans. But the initial anger and hurt has to be put on hold, because Jonathan also has some news to share. Well, first, he regales Clark about his initial experiences on Jor-El's ship and his early victories saving Earth and an alien race of indigenous people from slavery…which, wow. For a kid just starting out on his hero's journey, that’s not bad at all. He's already got the ease of his father, even when facing an invading army all on his own. Even his own mother recognized she wasn't needed by her son's side, even out in the deep recesses of space where unknown forces could do him harm. And while Lois was maybe right to go when she did to allow Jonathan to grow up on his own, maybe she should have stayed around. Because as Jonathan tells Clark and Lois at the end of the issue, as soon as she left, he started to get "the first hint" that Jor-El is "completely insane." DC readers already know that Jor-El's reappearance was nothing but bad news for Clark, so his return for Jonathan in earlier issues was definitely suspect. Clark didn't think Jonathan leaving with Jor-El was the right call given everything that Jor-El had done to Earth as Mr. Oz. And it looks like he was right. But what exactly is going on with Jor-El and how has it affected Jonathan over the years? On the surface, Jonathan seems to have grown into a normal teenager. He doesn't seem to have any emotional baggage or trauma. But there is that giant scar on his right cheek…did that come from Jor-El personally? Or did Jor-El put into motion a plan that got Jonathan (along with presumably a lot of others) hurt? If that's the case, and if he's still causing problems out in space, only Jonathan and Clark can stop him. But does stopping him mean breaking Superman's code? What happens if he threatens the world again, or even the entire galaxy? Jor-El doesn't seem like the go-quietly-and-easily type. What happens if he puts up a fight? Could we all be about to witness Superman and Superboy teaming up to kill Jor-El? I sure hope not. Crazier things have happened, but that would definitely be another scar from which our heroes might never recover.